I hope that there are other 1st (and 2nd) grade teachers out there that might find this analysis useful if they implement strategies to inspires students to talk about their mathematical thinking. We wanted students to produce mathematical thinking, not just consume it. Here’s what we created. If you’re wanting an example of a numberless word problems and data exploration I did in 2nd grade, click here. I conducted this lesson study with a team of 1st grade teachers. It was taught to 4 classrooms, and each lesson was a unique experience with its own twists and turns and choices. What we show here is the end result of how we revised the lesson throughout the day based on our observations of student learning. The lesson pathway below shows the main flow of the learning experience and took about 40 minutes. Further analysis and takeaways can be found at the end of this post, but I’ve tried to embed a lot of our thinking within the flow of the lesson. The content of this lesson centers around the Measurement and Data standards for 1st grade. Specifically, we wanted students to interpret data, make statements about graphs, and share their thinking (1.MD.4). The lesson allowed students to apply their previously learned skills about measuring and comparing lengths (1.MD.1, 1.MD.2). We designed this lesson in opposition to the GoMath lesson on reading and interpreting bar graphs. I don’t have an image to share, but you can imagine that the textbook lesson (like most textbook lessons) did a bulk of the thinking for students. A graph is displayed. Questions are asked. Students fill in blanks. In this structure, students see math as something that happens to them. They become passive consumers, not active producers of mathematics. Furthermore, the “answer textbook questions” style of teaching and learning exacerbates the affect of achievement gaps between students and hinders the learning for ALL students. It makes learning an individual enterprise under the authoritative guidance of the teacher and the book. In this lesson, we wanted to escape this dynamic. We wanted all students to have access to the content and to be able to participate in a collective and collaborative conversation about mathematics. In this way, differentiation is met through organic student participation in a strong collaborative classroom culture of listening and thinking. And that’s a tall order. I mean, they’re first graders. This lesson certainly had some hiccups. But we learned a lot. We’re committed to furthering our practice of implementing these strategies. Please share your thoughts. Help us get better together. We wanted a lesson that had students take their time and share their thinking. We wanted to shift the focus away from answer-getting and toward contextualizing and explaining. We wanted students at all levels to be appropriately challenge. We wanted differentiation embedded into the lesson. How do I spiral review to support and sustain fluency? How do we build students who feel positive about learning math? Students will compare numbers and interpret data. Students will communicate their thinking with each other and critique the reasoning of others. After a silent moment, we asked students to share their answers. Once answers were scribed, we asked students to take turns explaining how they counted them and paraphrasing each other. Students came up to the board and showed how they counted them. 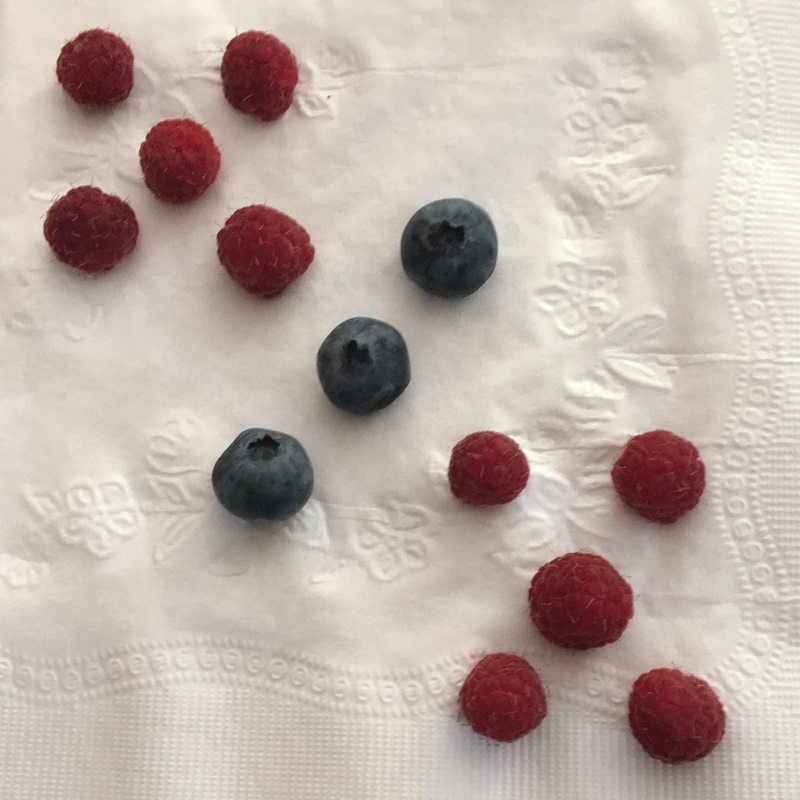 Some students counted 1 by 1, others saw two groups of 5 raspberries and 3 more blueberries. We scribed the mathematical structure of their thinking for them when appropriate. For example, 5 + 5 + 3 = 13. We then moved on to this prompt. The purpose of this prompt is to prime them for the next part of the lesson and also to provide an opportunity to internalize the objective. You are doing today’s lesson objective. You are talking about your thinking as you compare numbers. The rest of the lesson is structured by a Numberless Word Problem using a data display. We created this problem as a way to makeover their GoMath lesson so we could achieve our instructional goals to engage all students in talking about their math thinking while also learning skills aligned to content standards. More people like vanilla than strawberry. Fewer people like strawberry than vanilla. We scribed statements on the front board as students shared what they noticed. I have some more information for you about this graph. How does this change what we know? When we framed this moment well, students audibly expressed their surprise. They instinctually saw the situation had greatly changed. We had students talk at their tables. We then asked them to look at the statements they had made on the previous slide. What statements do you want to change? What statements are still true? We scribed new statements on the board as students made them. We seized on this moment when it happened as an opportunity to have students generate their own numbers to compare. If 20 people like chocolate, try to estimate how many like strawberry and vanilla. We scribed numbers on the bars and asked students if their estimates for the other bars made sense. We did not go deep here due to time constraints, but it was a wonderful example at how naturally students (and adults) use mathematical structure to fill in information gaps and make conjectures. We recognized it as another engaging gateway in to getting students to talk about math. It looks like you’re wanting to add numbers and structure to this graph. I love it! You’re doing some great thinking here and using math to explain. What you’ve created is great. I have some different data to share with you. Let’s look at one more image. We used this image to bring closure to the lesson and to return to our objective. Our objective today was to talk about our thinking as we compare numbers. Make as many statements as you can about this graph. During discussion time, we monitored the room for what students were saying and collecting data about the effectiveness of the lesson at meeting the objective. Eight people like chocolate. Six like vanilla. Three like strawberry. More people like chocolate than strawberry. Three more people liked vanilla than strawberry. At the end of the day, we reflected on our objectives and student learning. We looked at what the students had produced and examined the structure of the lesson in the GoMath text. We had gotten them to the same outcome, but had done so in a way that focused on students producing the learning rather than consuming it. In this model, the GoMath text becomes useful for practice, formative assessment, and extensions as a way to follow up lessons like these. I can’t stress how important it is for us as teachers to reclaim the vitality of instruction from lifeless textbook structures. This lesson study is one example of how teachers can collaborate, risk, experiment, and engage in meaningful professional development together as a way to achieve that goal. Some things we noticed and wondered and a few professional goals moving forward. The Numberless Word Problem lesson design can be effectively applied to graphs to promote student engagement and discourse for all learners. Clear objectives lead to clear questions lead to clear learning. Student enjoyment was high and participation was full. Students are able to apply their previous knowledge and make connections between length measuring strategies and the numerical value of bars on a graph. Students responded well and embraced the freedom to come up with their own answers and justifications. The missing information in the graph created more engagement, but some students still seemed unengaged at times. It’s important to find the right amount of talk time with class discussion (more listening) time. The Number Talk routine can be an effective and engaging learning experience at the beginning of the day, not just at the beginning of a math lesson. Some things we wondered: How do we find the balance between openness and also structure to maximize student learning and autonomy? How do we structure objectives and questions on the fly in response to what students share? It’s important to embed the objectives continually throughout lesson. I’m all in with students as producers of their own learning. I used the exact Number Talk images with my firsties last year. I’m excited to add in the graph component with my new group. At what time in the school year did this lesson occur? Love tbis post. I never thought about the possibility of numberless graphs in first grade, but it makes complete sense. They always struggle with how many more or less. This is a great way to get the conversation started. I am definately sharing this idea\post with teachers today. Glad you liked it Sarah! Would love to hear more about what you learn and how we can make it better! This is absolutely exciting! I also am at a school that used GoMath and I’m always frustrated by trying to cover everything and by the lack of investigative problem solving and reasoning activities. There are none! I supplement a lot. I look forward to trying this numberless graphing with my 1st graders this year. Thanks Marci! I’m glad you find it useful. Let me know how it goes. I’d love to hear how we can make it better and what you learn.